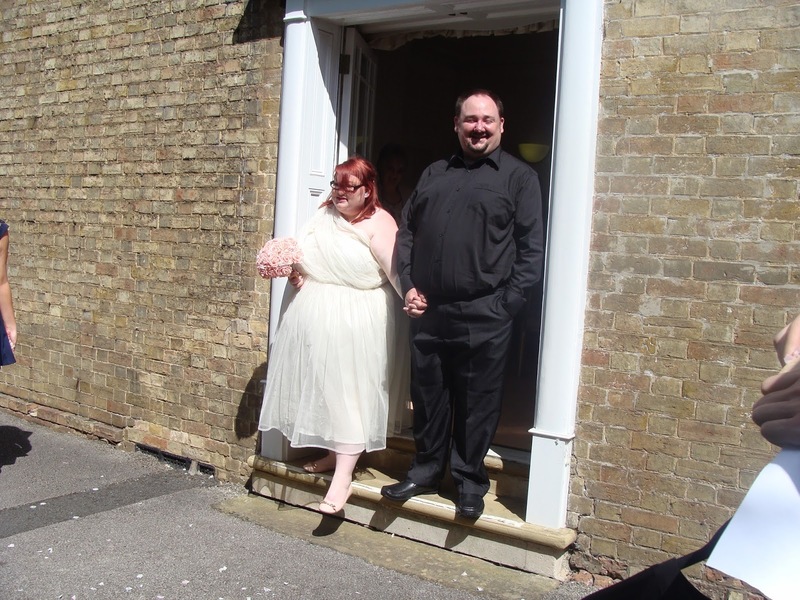 I always find it funny when people ask for photos of fat brides etc, because I never thought of myself as one – I was just Sophie, who was getting married. 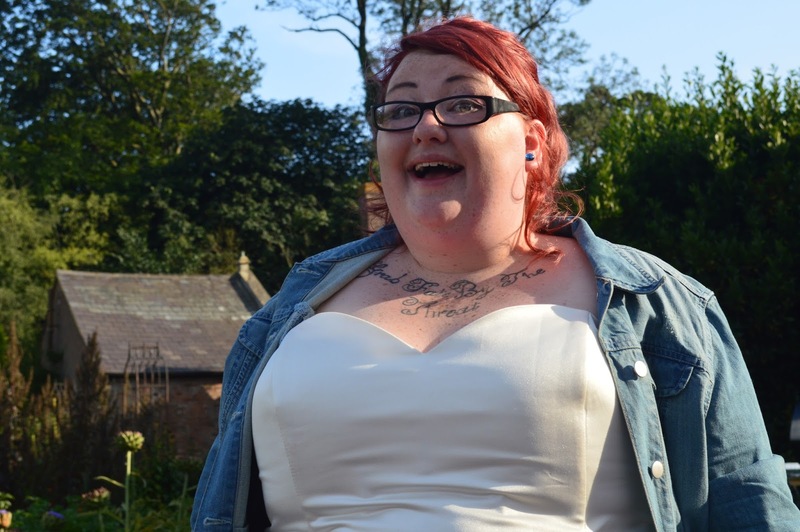 But as body positivity becomes more and more accessible to the masses, the idea that everybody is entitled to exist exactly as they are is sneaking across into the bridal sector. And I couldn’t be more thrilled. As a bride-to-be, you get all the usual questions – “have you set a date?”, “how did he ask?” and then the only question anybody actually cares about: “did you find your dress?”. That’s right – not ‘a dress’, but ‘your dress’ because much like soulmates, your ideal match is out there somewhere and completely irreplaceable. Personally, this makes me a little bit sad when I think about planning my wedding. I was still very much getting used to being acceptable as I am, and I was terrified of visiting a dress shop to be told that nothing would fit me and leave there red-faced and empty-handed. So I never got to visit one dress shop. Yep, that’s right. I never took my Mum and best friend to sit in the waiting room, poised and ready to gasp at my beauty. It never happened, and maybe because I thought that even if something did fit me, I would definitely not look like a beauty. I blogged about my ‘stress with the dress’, because nothing I was finding was quite what I had in mind. 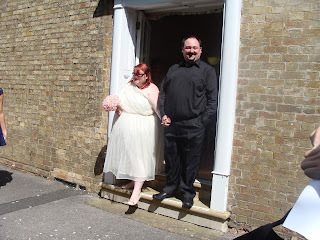 In the end I decided to go for a Honeypie Boutique custom made dress, which was around £150, and an ASOS one-shoulder dress for the registry office the day before our ‘service’. While it fit me perfectly and was in tone with my wedding, I do have little heart-pangs when I see the dresses available to size 24+ brides that there are now. I haven’t even been married a year, and there are gorgeous options, actual bridal shops and everything! Shopping for my dress 100% made me feel less than worthy, and it is my only sad memory of wedding planning. Perhaps I will have a vow renewal in 2025 and there will be ALL kinds of options! My next disappointment was very much to do with shoes. Now, this isn’t strictly because of my size. There were lots of beautiful wedding shoes available to people with extra wide feet. My issue was that I didn’t want pretty white court shoes, or anything with a heel. 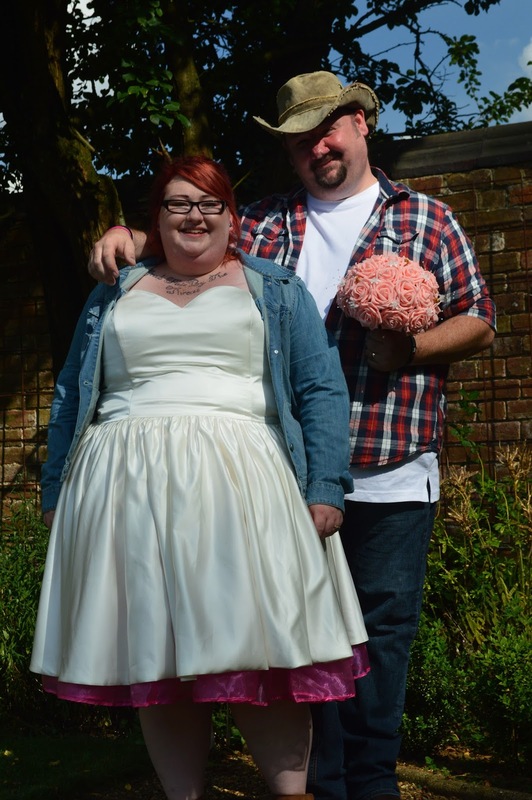 I had a redneck garden party as my reception, and this hillbilly needed some white cowboy boots! I was unable to find anything within my budget, in the UK, which fit my 19” calves. After months of trying, I gave up. I ended up getting some little brown shoes from Tesco. They did fine, but again, they weren’t my ideal wedding shoes. Yes my needs were specific (though I did eventually relent and say I’d accept shoes that weren’t white, as long as they fit!) but I felt like I was constantly “just too big” for everything I liked. It was so easy to get demoralised, and in that awful headspace where you want to punish your body just for existing. ENTER, UNDIES. Wedding underwear is a must – and ladies, you’re in luck! There are gorgeous underwear sets for big ladies, many many specialist sites and an increasing number of high street stores who are selling us extended hip, cup and back sizes for the same price as we’d have paid if we were straight sized. And I kind of feel like if wedding planning is making you feel frustrated and held back because of your body’s mere existence, get your mojo back by throwing on some gorgeous undies. Revel in the way your body looks. Stand in front of the mirror and practise your poses. Love every fold, every squishy bit, every soft curve. Bam. You’re wedding-night ready. The only other aspect of the wedding day that I have heard of people worrying about is sweat. Now, my wedding was a little different because it was outdoors and it was literally on the hottest afternoon of 2015 (clearly I prayed to the God of Summer just a little too hard when I asked for no rain…) so I basically dripped sweat the entire time and my thighs were chafed to buggery for a week or so afterwards – yes I was wearing shorts under my dress! – but to be completely honest, your wedding could be in mid-December and sweating is just something that is going to happen. You’re usually in a fitted dress for a start, but even without the dress you’re surrounded by a bunch of people, you’re moving around constantly, chatting to everybody, having cuddles and kisses – it is just going to be a sweaty day. In fact, most hair and make up artists will tell you they’re doing certain things to counteract sweat in pictures etc, which goes to show that every bride worries about and probably experiences wedding-day sweat! Finally, dieting. I never considered dieting for my wedding. I think pre-wedding crash diets are absolutely heart-breaking, and the idea of adding pressure to this already stressful time for the sake of a smaller dress or “better photos” honestly makes me feel really sad. 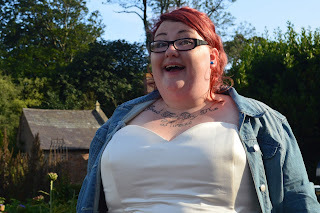 I cannot stress this enough: if you are a plus size bride (or a straight-sized one, for that matter) losing weight is not an expected element of wedding preparation. Please don’t feel pressured. Please deflect questions, if anybody is rude enough to ask you any, by saying “I want to marry my husband/wife as the person I am, and the person I intend to be for the rest of my life”. And then get to your wedding, dance the night away and have the time of your life. Congratulations! this isn't me! It's a guest post.